Like all teenagers, Miley Cyrus is starting to learn about choices and consequences. Like most teenage entertainers, she is also becoming wise to the ways of making choices that will produce the most favorable consequences. 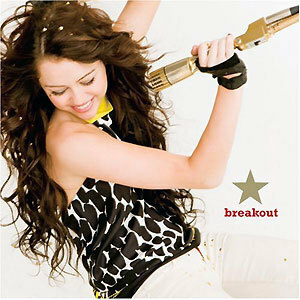 Coming on the heels of l'affaire Vanity Fair, Cyrus's new album, "Breakout," finds the Disney Channel star returning to her factory setting of trying to please most of the people most of the time, without completely obscuring her own songwriting voice. She mostly succeeds on this appealing, compact album that's out today. It offers her young fans a bit of every current style that can have the word "pop" appended to it - country, soul, punk - and, to please their parents, it subtracts any trace of edge from all of them. Cyrus is only 15, so that's just fine since there will be plenty of time to define her edges as she grows and matures. Right now, Cyrus, who wrote or co-wrote most of the album's tracks, employs a perspective that suits her and her fans. She remains boy crazy in a wholesome way - hand holding and kissing only. She also loves hanging with her girlfriends, gets fidgety in school, and can't decide whether she likes or hates a potential boyfriend but knows she can't stop thinking about him especially when his ringtone is blowing up her cellphone. "Breakout" opens in the pure pop realm with the Go-Go's-style fizz of the title track. As the snares skip and the keyboards shimmer, Cyrus pines for the last bell of the day so she and her friends can "have some fun and lose control." A hint of Avril Lavigne's brand of pop-punk snarl creeps into "7 Things," in which Cyrus mulls over a relationship during the melodic verses and ditches the two-faced dude during the speedy choruses. She dismisses his potential text-message apologies with a curt "I'll delete it." "The Driveway" continues that theme with its insistent riff and teenage break-up tableau. The mood shifts for a revved-up take on Cyndi Lauper's frolicsome "Girls Just Want to Have Fun." And it shifts again with the album's most interesting tune, a sort of electro-industrial track called "Fly on the Wall." Cyrus taunts the listener for being on the outside of her inner sanctum. Whether the target is a former boyfriend, the media, or even her fans is unclear, but the heavy electronic beats and processed vocals definitely represent a change of pace. The shifts start to become untenable as that track is followed by the overenunciated pop soul of "Bottom of the Ocean" and the call to eco-consciousness "Wake Up America." Cyrus is endearingly earnest if not lyrically elegant when she essentially admits that she doesn't know exactly what's up with this global warming but believes there's something we should all do about it. "These Four Walls," written by MTV star Cheyenne Kimball, and "Goodbye" offer Cyrus's best, most nuanced vocal performances and a rootsy, more natural-sounding accompaniment that could be a smart direction to head in the future. With "Breakout," Cyrus has clearly made a choice to break from the shiny, happy "Hannah Montana" character, but she hasn't scuffed her sound up so much that her fans won't recognize that she's just being Miley. Discuss Will you buy the new album?